Minnesota Gov. Tim Pawlenty and five other governors arrived in Baghdad Tuesday morning for a two-day trip to Iraq, which was arranged by the Bush administration. Pawlenty says the governors want to visit troops stationed in Iraq and learn more about the U.S. mission. He says the Bush administration plans to send more Minnesota National Guard troops to Iraq later this year. St. Paul, Minn. — Much like President Bush's secret visit to Iraq over Thanksgiving, the governors' trip was kept under wraps until they landed safely in Baghdad. Pawlenty and the governors of New York, Hawaii, Oregon, Idaho and Louisiana spent the day getting an overview of the situation in Iraq. Pawlenty held a news conference by phone from Baghdad Tuesday, where he talked about the mission of the governors' trip. Pawlenty says the six had a military briefing with Gen. Ricardo Sanchez, head of coalition forces in Iraq, and met with U.S. administrator Paul Bremer to discuss reconstruction efforts. Pawlenty says the Bush administration wants governors to understand why U.S. troops are in Iraq. "As more and more is asked of our National Guard and Reserves and our military in this country, it's important for governors to understand the mission," Pawlenty says. "So as we talk at deployments and talk to families, we can explain the importance of why people are here and doing what they're doing." Pawlenty says the makeup of the force in Iraq will change, and more National Guard troops will be called up to serve, from Minnesota and other states. Minnesota National Guard officials say about 175 Minnesota National Guard troops are currently serving in Iraq. Col. Denny Shields says those Guard members will soon leave Iraq, and another 250 or so will take their place. As more and more is asked of our National Guard and Reserves and our military in this country, it's important for governors to understand the mission. The governors had dinner with the troops at the same tent where President Bush ate Thanksgiving dinner with the troops. Pawlenty says coalition soldiers are trying to stabilize the most dangerous region in the world. "Iraq is attracting more terrorist acts by people from other countries who don't want us to succeed here," Pawlenty says. "So the terrorists are flocking to Iraq, and now the frontline in the war on terror is in Iraq." Pawlenty says he's not worried about his personal safety. He says the governors traveled around in armored SUVs, escorted by Humvees and security staff with machine guns. The governors were not in the vicinity of a car bomb that exploded about 20 miles outside of Baghdad. The governors are spending the night in Amman, Jordan, for security reasons. Pawlenty says when the group left the Baghdad airport to fly back to Amman, the pilots told them the plane came under some small arms fire. Pawlenty says he's not exactly sure why he was chosen for the trip, but says the White House told him they wanted geographic balance among the six governors on the trip. It's also a bipartisan group, with four Republican and two Democratic governors. Legislative leaders praised the governor's trip. DFL Senate Majority Leader Dean Johnson of Willmar is a brigadier general in the National Guard. Johnson says Pawlenty's trip will help boost the troops' morale. "I would fully support, 100 percent support Governor Pawlenty on his visit," Johnson says. "Because one of the things that young people deal with is their emotions and being homesick and certainly in harm's way, and he will bring a presence of, 'We care from Minnesota' to our young men and women." 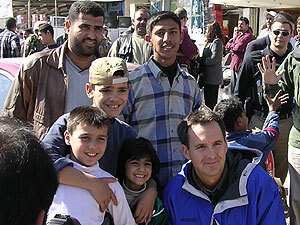 Pawlenty visited Minnesota National Guard troops in Bosnia in November, and has spoken publicly about wanting to visit the troops in Iraq. Pawlenty left the state during the second week of the legislative session, but legislative leaders didn't question the timing of his trip. Republican House Speaker Steve Sviggum of Kenyon says most of the Legislature's work is being done in committee right now. "State of the state address is done, the budget doesn't come out -- the budget forecast -- for another 12 days, so if you were going to be gone for a part during the legislative session, this is a good time to be gone," says Sviggum. Pawlenty traveled without any staff or State Troopers. The federal government is paying for the governors' trip -- the only cost to the state is Pawlenty's round-trip plane ticket to Washington, D.C. He'll return to D.C. on Thursday for a possible meeting with the president before returning to Minnesota on Friday.